Scooper - Technology News: The world's poorest people need access to clean energy. How can we get it to them? The world's poorest people need access to clean energy. How can we get it to them? To begin, imagine you are Esther, a woman living in a deeply rural part of Kilifi county in Kenya. To get to the nearest town you need to travel for three hours on a matatu (public minibus). Your area is remote and the road is almost inaccessible. The matatu only travels to Malindi – the nearest town – three days a week. You have seven children and depend on your small farm for both sustenance and income. At night, you and your family all depend on the light of a small koroboi (kerosene lamp) to study and perform other duties. When you can’t afford kerosene for the day, your family stays in the dark. But, you are keen to start using cleaner and more efficient forms of energy and save the income you spend purchasing kerosene. As Esther, you are at the first stage of the energy ladder and keen to rise. The Energy Ladder is an illustration of the journey an unconnected individual, family or community makes in their path to electrification. Like Esther, 70% of the population in sub-Saharan African countries lack access to electricity and must choose alternative energy sources. Previous models of the energy ladder have assumed a linear progression from wood to charcoal, kerosene, LPG and eventually electricity. Numerous investors and businesses have moved into sub-Saharan Africa’s renewable energy space aiming to solve this energy poverty while simultaneously creating a market for their products. These products have significantly altered the way the energy ladder presents itself on the ground in Africa. 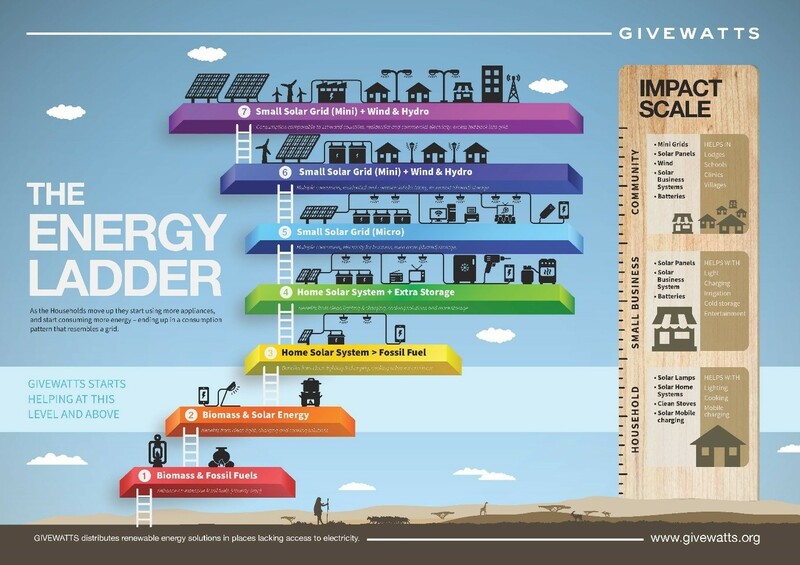 Our revised version of the energy ladder begins with households using traditional energy sources such as biomass and fossil fuels, they later introduce solar power in modules, beginning with the smallest lamps then continuing to home systems and eventually to micro and mini-grids. Later, electrification occurs and usage is akin to that found in developed countries. Traditional wisdom often represents society as an income pyramid and it is useful to look at this economic pyramid alongside the Energy Ladder. The basic idea is that the base of the pyramid is the largest segment of the population and is usually made up of those with the lowest income. Customers at the Bottom of the Pyramid (BOP) make up over 70% of the population in African countries. This population is a mirror image of the same percentage that lack access to electricity. Just like Esther, these BOP consumers are usually based in rural areas, have significant development needs and very low purchasing power. As a result, they have little choice and access to goods/services due to a rural location and their low purchasing power. The link between the energy ladder and the economic pyramid is clear. Consumers at the BOP will purchase products at the bottom of the energy ladder. As they experience increases in income and savings from using cleaner energy products, they are able to move up both the energy and income ladder and purchase products at the next level of the energy ladder. Customers at the lowest tier of both the energy and income ladder usually do not have any clean energy products in their arsenal; they begin consumption with the most basic solar lamp. Are any solar companies truly servicing East Africa’s BOP? There are numerous players in East Africa’s renewable energy space who claim to be servicing customers like Esther and others at the Bottom of the Pyramid. In theory, selling to the BOP is a viable business proposition because the market is large and underserviced. Selling to this market is hard for numerous reasons. In this article, we will highlight four. First, this market is in Africa’s most remote and rural areas and distribution poses a huge challenge. Second, the BOP population have the lowest incomes and are unable to pay the high prices needed to compensate these high distribution costs. Third, the products that most companies are selling do not match the needs of the BOP; they are better suited to consumers at higher levels of the economic pyramid. Lastly, the cost needed to close the final gap between the BOP customer and the business is expensive for both the business and the customer. For these reasons – and many more that we will not be able to discuss here - players in East Africa’s energy space who claim to sell to the BOP are not actually doing so. Most companies in the space do not target rural areas and are based in urban or peri-urban areas. In Esther’s case, the nearest clean energy shop would likely be based in Malindi, the nearest town that is too far and too expensive to frequent. Companies that build or are building their own distribution network base their shops in these small towns and not in the rural areas where the BOP customer is. These regional hubs may be closer to the BOP customer, but still do not close the last mile. The low income of a BOP customer and the mismatch of solar products to their needs feed into each other. Consumers at the bottom of Africa’s economic pyramid live on between $0.90 and $2.00 a day. On this income, no BOP customer can afford to pay upfront the price of even the cheapest solar product at the bottom of the energy ladder – a basic solar lamp priced between $10 and $20. Ironically, most of the products in the market are not small lamps but larger and more expensive home systems. Therefore, not only are the products too expensive, they also do not match the needs of the customer. Most of the products in the market are on the third and fourth tier of the energy ladder. Meanwhile Esther, the typical BOP customer, has not even made the first step. Evidently, there is a mismatch between the customer and the seller. Both sides of the business transaction need cash. The seller needs cash not only to distribute, but also to sustain the customer before they can fully pay off the product. Businesses have developed PAYG, lease-to-own and other instalment based payment models to cater for the fact that the customer can’t pay upfront. However, this subsequently means that the business needs a large amount of working cash to service the customer before they complete their payments. The customer payback period can range from a couple of months to a couple of years. Unfortunately, even these unique models still do not make up for the fact that the product is above a customer’s level on both the energy and income ladder. Even daily instalments as low as $0.40 a day, would still prove too expensive for a BOP customer whose income goes largely to necessities. Businesses don’t go to the true BOP. When they do, they run a real risk of giving loans to customers who can’t pay. So, how exactly can we get clean energy products to the BOP? We recommend that the market needs not only working capital, but also new and innovative business models that allow companies to take products further down the economic pyramid and right to doorstep of Esther at the BOP.